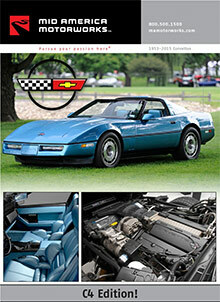 The Mid America Motorworks Corvette parts catalog features all of your essential Corvette parts and accessories for sale whether you're performing a restoration, modification or resto-mod. Shop for Corvette performance parts, wheels, exhaust and more Mid America Motorworks Corvette parts that are in stock and ready to ship. Corvette parts catalog - If you're shopping for Corvette exhaust systems, floor mats, car covers or other specialty accessories, you've pulled into the right garage. The Mid America Motorworks Corvette parts catalog features hundreds of quality Corvette parts for sale including Corvette performance parts, wheels, interior and exterior accessories for your vehicle. Corvette Wheels - The Mid America Motorworks Corvette parts catalog features a wide variety of Corvette wheels and tires that are just right for your model. Find ZO6, ZR1, C6, C5, C4, C3, C2 and C1 Corvette wheels available in chrome finishes, black chrome, machine polished, black, gray and painted, as well as Corvette tires from Goodyear, Yokohama and Kumho wheels and rims of all sizes. Corvette Performance Packages - Shop for Corvette performance parts and engine parts individually or in high performance packages available for 1997-2012 model Corvettes. Take the guesswork out of upgrading your Corvette with packages that include induction systems, exhaust systems, thermostats and more components that work together to significantly improve Corvette performance without adversely affecting drivability. Corvette Accessories - Find all of your prime Corvette accessories to bling out your prized Corvette, plus other items that help you celebrate the Corvette lifestyle. Enjoy high quality car covers, floor mats, car seat covers, paint, Corvette themed apparel for men, women and children, jewelry, Corvette books and manuals and other accessories all available in the Mid America Motorworks Corvette parts catalog. When you're on the lookout for the leading Corvette parts and accessories for sale, you can always count on Mid America Motorworks where you'll find hundreds of affordable, high performance products all showcased in the pages of their trusted Corvette parts catalog. Pursue your passion with Mid America Motorworks!